Let’s imagine you came to meet my friend Vinod (b|t) and asked him to find “Readable Secondary” word in our book on AlwaysOn of 420 pages. How would he do it? Do you think he would start reading each and every page to find that word? No! He knows that there is a Index page at the end of the book which will tell him the word and the page number where its located. Our search becomes easier with the help of Index, correct? In the same way, SQL Server also uses indexes to find a row which you are asking to select/update/delete. In my previous blog about T-SQL constructs, we have discussed that index on in-memory need to be created during table creation itself. Alter of in-memory table is not allowed. Here are the few point we should be aware. Indexes on in-memory tables reside only in memory. Only index definition is stored on disk and index structure is created while starting of the database. Refer this blog. At least one index is needed. For SCHEMA_AND_DATA durability a primary key needs to be created. The memory optimized table ‘TableName’ with DURABILITY=SCHEMA_AND_DATA must have a primary key. If we use SCHEMA_ONLY as durability then here is the error message if there is no index declared. The memory optimized table ‘TableName’ must have at least one index or a primary key. There is no concept of clustered index on in-memory table. Only non-clustered indexes are supported. Could not create in-memory index ‘IndexName’ because it exceeds the maximum of 8 allowed per table or view. String column on which index is created must use *_BIN2 collation else we would encounter below error. Indexes on character columns that do not use a *_BIN2 collation are not supported with indexes on memory optimized tables. Now, let’s understand the type of indexes which can be created on in-memory tables. There are two kind of Indexes, Hash Indexes and Range Indexes. In this blog, I would explain hash indexes. Since there is a lot of information, I will continue about hash indexes in next post as well. At this point, it is important that you know the row structure of in-memory tables. I have already blogged about it in my previous post here. Hash index is a list of pointers and each of them is called as bucket. (Wikipedia) The number of buckets needs to be specified while creating the index. It is important to note that the number of hash buckets can’t be changed once table is created. There is no alter operation possible so we would end up in dropping and recreating the table for re-declaring the bucket count. Let’s assume for simplicity that I have created index with 4 buckets. I will start with very simple example with 4 has buckets with three rows and only one hash index. Now, let’s assume that I insert another value SQLServer into Name column. Which bucket it would be? Since len(SQLServer) = 9 it would fall into bucket # 3 but we already have a row sitting there. This is the situation which is called as “Hash Collision” In this case, SQL Server would add a pointer in the existing row to point to next row as shown below. Now imagine a situation that we have many rows (may be 10000) and have less buckets (only 4) then there would be a lots of hash collisions and length of chain would keep on increasing for each bucket. This would cause performance degradation while search for data in a bucket. Let’s understand a small concept about BUCKET_COUNT parameter in SQL Server. Number of bucket for a hash index is defined using BUCKET_COUNT parameter during index creation. 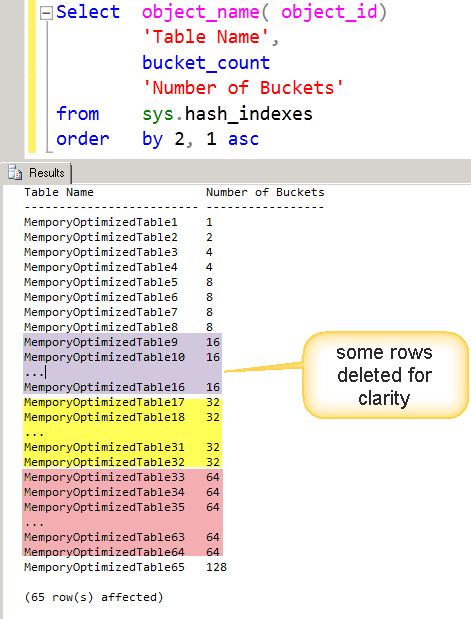 SQL Server creates number of hash buckets as always power of 2. If we declare number of bucket which is not a power of 2 then it would be automatically rounded-off to next number which is exact power of 2. In my example above, I have given BUCKET_COUNT as 1000. Doing a little math, we can easily find that next valid value would be 1024 (2^10). Let’s have a look at demo to understand this better. As we can see above that even if we have declared Bucket_count as 9, SQL Server has rounded off to 16. Here is the simple script which can be used to find the number of buckets for a given input value. This blog has become longer than I expected.. There is a lot more to cover about hash index I would continue discussion about hash indexes in next blog.